Poor solder wetting is a common problem. If you’ve been in the assembly industry for any length of time, it’s probably happened to you before: the solder seems to have flowed only part of the way onto the pads or component leads. It might look grainy or dull, too. We’ve been there, too. That’s why our team has researched and tested ways to fix the problem – and our solder paste formulas are designed to maximize wetting. What causes poor wetting, and why is it a problem? Ideally, solder paste achieves 100% wetting, with no gaps or areas missed. 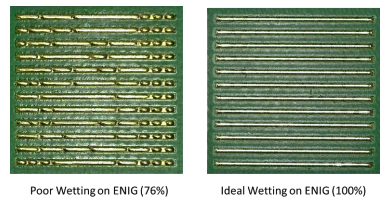 These circuit boards have all been printed with the same wetting pattern, showing what various levels of wetting look like on ENIG and OSP surfaces (see images below). High wetting values mean that there’s a good spread of solder paste during reflow, which is necessary for well-made solder joints. There are definite steps you can take to improve wetting. Not all of these steps are always possible, so select the strategy that works best for your design. 1) Use a higher-activity solder paste. As detailed in this paper on how surface finish affects solder paste performance, choosing a different solder paste can dramatically affect wetting performance. That’s why we offer a variety of solder pastes to suit unique manufacturing needs, all with good activity to encourage maximum wetting. 2) Minimize oxides on the surfaces being soldered. If you can choose to work with a less-oxidized surface material… do that! However, we know that’s not always possible. In addition to a higher-activity paste, you can also opt to use nitrogen during reflow. This helps minimize the oxides that build during the reflow cycle. 3) Use more solder paste… or larger leads. One way to fix the issue of poor wetting is to change the stencil so that you’re using a higher volume of solder paste. If you can’t use more solder paste, another option is to choose components with larger leads. This helps compensate for the low volume of paste and helps complete the solder joint. 4) Adjust the reflow profile. Increasing soak time will help equalize your soldering temperatures and eliminate trouble spots, allowing for good wetting of both the pads and component leads. Increasing time above liquidus will help to allow for the complete flow of the liquid solder before it begins to freeze. Experiencing solder wetting issues? Need help? This paper presents a process for evaluating solder pastes using a variety of quick-to-run methods that reveal the strengths and weaknesses of solder pastes. Methods include print volume, stencil life, response to pause, open time, tack force over time, wetting, solder balling, graping, voiding, accelerated aging, and others. The goal is to help the electronics assembler choose the best solder paste for their process with methods that don’t require expensive equipment or materials but still generate useful hard data.